Here's my standard set of recommendations for Theravada Buddhism. If you are interested in other traditions, then other people will recommend more suitable books. I think the classic book What the Buddha Taught is one of the best starting points there is. It's a rather basic text, but at the same time it covers a lot of ground. Definately a must read. There are other more comprehensive introductory books, but they are a bit more technical. Another amazing book is the Ven. Bhikkhu Bodhi's book In the Buddha's Words which is an anthology of just a few of the Suttas along with some excellent introductory essays. This book is probably the best introduction to Buddhist scripture out there. This book is the only one on this list that isn't available for free on the internet, but for a little over ten dollars, I'd say it is definitely worth it. The Ven. Bhikkhu Bodhi also gave an introductory summary of Buddhism in the early 80's called The Buddha's Teaching As It Is which is quite good. His Systematic Study of the Majjhima Nikaya is one of the best lecture series there is in my opinion. You can find some articles he wrote here. I especially recommend the article "The Buddha and his Dhamma" and "The Noble Eightfold Path". Sutta Central is probably the go to place for translations from the Pali Canon. Here's a pdf of Mindfulness of Plain English, a very popular and general text on meditation. Here's a good meditation manual from Ajahn Thanissaro about Mindfulness of Breathing. Another amazing book is the Ven. 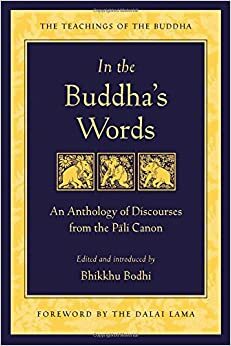 Bhikkhu Bodhi's book In the Buddha's Words which is an anthology of just a few of the Suttas along with some excellent introductory essays. This book is probably the best introduction to Buddhist scripture out there. The book isn't available for free, but for a little over ten dollars, I'd say it is definately worth it. If you want to practice meditation according to the Mahasi Sawadaw tradition, then read this pdf of Practical Vipassana Exercises is a very good book. I recommend two good books to start out with. Cyanocobalamin already mentioned Dr. Walpola Rahula's free book What the Buddha Taught which I also highly recommend. Another good book would be the Ven. Bhikkhu Bodhi's book In the Buddha's Words which is an excellent short anthology of some of the Buddhist scriptures with very good introductory essays. I also highly recommend the Ven. Bhikkhu Bodhi's talks. He gave a general summary of Buddhism in this series of talks and his Systematic Summary of the Majjhima Nikaya is a very accessible and comprehensive series of talks on one of the Buddhist scriptural collections.